Posted on May 5, 2016 May 10, 2016 , in Truck Mounted Equipment. BAUMA is the largest trade fair in the world – the only fair that brings together construction machinery in its entire breadth and depth. It’s the innovation hub for the industry – so of course, our three star product lines were there to show off. HIAB presented its biggest cranes: HIAB X-HiPro 1058 and 858 – already available at Atlas Polar. Faster, cleaner, and cheaper with 40% lower installation costs, they save about 180 hours of labour on a standard crane. Attendees also met the newest member of the family, the HIAB X-HiPro 558. The strongest crane yet, the 558 can be mounted on a three-axle truck and is designed for heavy and bulky loads. 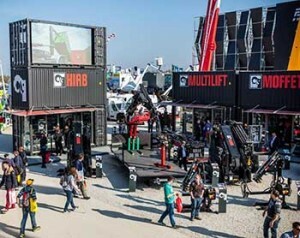 People also got a first glimpse of the smallest powerhouse cranes – the recently launched HIAB T-Series. 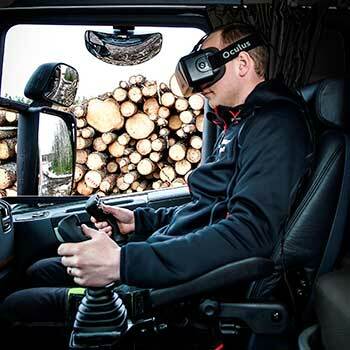 Nearly 3000 visitors got to try out HiVision™, 3D virtual reality goggles that will revolutionize crane operation. Operators can view the entire area from atop the crane from the safety and comfort of their cabin. It’s a bird’s eye view for forestry industry. Also at the forefront were updates to two of our popular features: VSL+ and LSS. VSL+ takes advantage of load capacity to act as a counterweight, increasing stability at sites where it’s impossible to use full leg extension. The new Load Stability System (LSS) helps protect truck, crane and cargo by compensating for unintentional movements during vertical operation. On the horizon: In future, the operator won’t even have to be in the truck to operate the crane. MOFFETT showcased the new electric-powered E4 truck-mounted forklift with zero emissions and completely silent operation. And MULTILIFT premiered the Optima, a smart new hooklift that will significantly boost productivity through fast operation cycles. Here at Atlas Polar, we’re proud to be the exclusive distributor of Multilift Hooklifts, HIAB Cranes and Moffett Forklifts in Canada. Quality, reliability, innovation and performance, backed by an international and national service network have made these products global leaders, and have made Atlas Polar #1 in Canada. Check out our full range of truck-mounted cranes, forklifts and hook lifts.